Obtaining qualified staff in STEM-subjects (science, technology, engineering, and mathematics) is of fundamental importance for business and science in Germany. 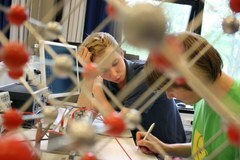 Science competitions are a key element in preparing qualified students in science. They aim to spark interest as well as identify and systematically support the most talented students. However, not much is known about the effects of competitions on participants’ further development. Thus, the current project aims to investigate which factors determine success or failure in science competitions as well as the influence of success or failure on students’ further cognitive and affective development and on their career choices. All departments are involved. Within the framework of the project, the IPN is cooperating with Prof. Dr. Detlef Urhahne (University of Passau).